Flowers have the ability to brighten anyone's day. It's indeed the best gift of nature that heighten your cheerfulness and delight your mood. 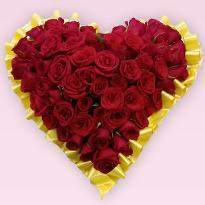 Online flower delivery in Mumbai can bring a beaming smile on your loved ones face. Now it's the time to give a token of a smile to someone you love by sending flowers. 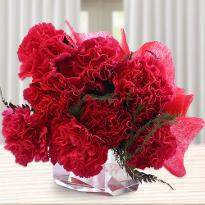 Winni offers a wide range of flowers that are ideal for any occasion or event. Whether you want to send a bouquet of roses or a special arrangement of flowers, you name it and we have it. Order and send flowers online without any hassle. Flowers are now getting very popular as bunches as bouquets. 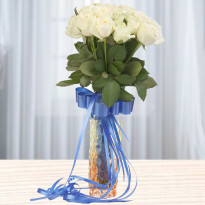 Bouquets make a beautiful present on any occasion personal or professional. Flowers also complement the gifts very well. Bouquets alone make a statement of your emotions in a very warm way. You can give flowers to anyone on any occasion, it is always accepted as lovingly as presented. 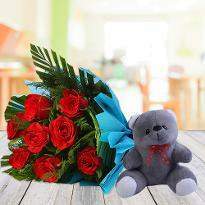 Winni offers Online Flower delivery in Mumbai, now you can get wonderful flowers delivered at any place that you want. If on any occasion you are not there with your loved ones, simply send flowers to Mumbai and make your presence felt.The flowers we deliver are fresh and crafted beautifully into the arrangement chosen by you for Valentine flowers delivery in Mumbai. Unique and exotic flowers and arrangements are available which you will find nowhere else. 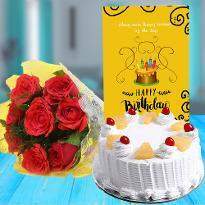 You can place order for birthday cake and flowers delivery in Mumbai also. 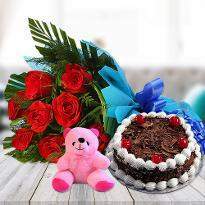 You can choose various combos having flowers and cakes and get them delivered to the place of your choice. 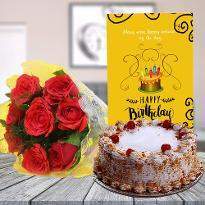 Even if you are looking for cake in Mumbai along with flowers you can also opt for online cake delivery in Mumbai along with flowers for same day delivery. 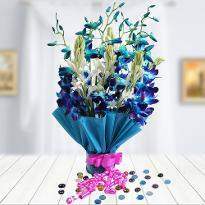 Midnight flower delivery in Mumbai is also available through Winni. You can surprise your loved ones with exquisite flowers in the middle of the night. So don't worry about the flowers for the occasion just order flowers online and enjoy the celebrations. Nature's beauty is reflected in the colors of the flowers. The multitude in flowers color, fragrance, and aura is overwhelming in itself. It is the way nature calls other creatures to come and enjoy the beautiful world of Lord and his creation. No doubt, why flowers have been used by mankind to show affection and care to other people? Flowers even continue to be a great option for gifting purposes. Winni is happy to announce to you all that the flower shop is now open keeping in mind the needs of today’s generation, especially their gifting style and the things which will make someone day’s special. Give your loved ones a token of love with a flower. You are happy when you see the smile on the face of your loved one and a gorgeous bouquet of flowers prepared by Winni is a sure way to bring a smile to their face. People in modern times are ever busy, all involved in their duty or job. They forget about their basic necessities and time they should spend with the people dear to them. The only thing that occupies everyone’s mind is work. But ones, you realize that you also have a life and responsibility outside you work too you realize that you do not have any idea on how to celebrate the happy times with your dear ones. Simple yet beautiful flowers are one of the best ways to make up for all these terrible mistakes and turn it to happiness through Valentine flowers delivery in mumbai. In short, flowers are your best friend when you want to go for safest gifting item. Mumbai is a city of dreams and wishes. Everyone is in hurry for something and the other in the pursuit of dreams often forgetting the presence of other people nearby. 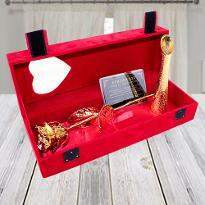 To fit into this tight schedule, while at the same time, being able to show your affection to your loved ones, Winni has brought to you a range of solution you can use to your favor. Winni brings in Mumbai for the first time, delivery of flowers, to the doorsteps of your loved ones on demand. It is just as easy as one two and three. You just have to select your favorite color from the catalog of flowers and bouquets and give us the address of the intended place and we will get your job done within time. The Online delivery flower in Mumbai has never been this easy before. It may happen that sometimes when you wanted to stay in Mumbai the most you had to be absent and go for tour trip at an outstation. Feeling bad that neither you could stay back for your loved ones on their important day, nor even able to gift them to show your love? It would have been the case if Winni was not present, but Winni has got your back. Now you can leave all these hassles on our shoulder. 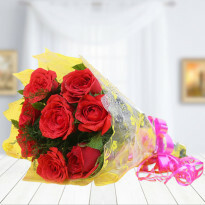 You can send flowers to Mumbai from the comfort of your room without any problem. All you need to do is to place an online order and send us the address of delivery and the time when you want to it to be sent. 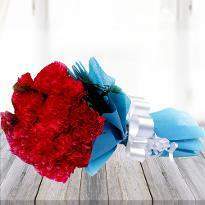 Send the warmth of your love to your loved ones even if you are miles apart from them with Winni's flower. Gone were those days when buying a flower in your busy schedule was a hectic task. Now for every extraordinary event, Winni has come to the rescue. Winni is located at one of the most accessible places that make it easy to operate in Mumbai and for Mumbaikars. Whatever the occasion may be online flower delivery in Mumbai is swiftly provided by Winni. All you have to do is order flowers online in Mumbai and we are right there at your doorsteps. You will never fail to surprise your beloved ones no matter whatever the situation may be. Be it a small Valentine's day token or a mother’s day love. We are ready at your service all the day around providing you with quality flowers. Our online portal has ensured that all your work can be done without any hesitation. 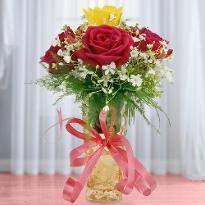 Send online flowers in Mumbai or a combo pack, all of these will be completely done to perfection by our competent team. Sending flowers and bouquet have never been so easy. Wherever you reside in the different city and wish to send some love to your near and dear ones in Mumbai, you can avail Winni’s online flower sending services in Mumbai and let they feel your warmth. Mumbai is so vast that it is not easy for the localities to access to each service available whenever they wish or want to. So our team has come up with our online portal for better service. Whatever the occasion be, if you feel like giving some flowers, then our team is at your service on same day online flowers in Mumbai sends flower without you stepping out of your comfort zone. Our gorgeous collection of flowers and fast delivery arrangements makes us the perfect partner for all your celebration works. We have assortments of flora, a gorgeous collection of bouquets. Since Mumbai is ever changing city with needs of people changing every day, we at Winni’s have come up with a solution to this problem. Our online portal management team ensures all the transactions are smoothly managed and orders placed are taken at super speed. We even provide services for people living in Mumbai to send their token of love to other parts of Mumbai. If you are not available for somebody's important day and you need to send your warm wishes to them, then you can send flowers online in Mumbai from Winni. Our site is accessible to every single area of Mumbai. Our online flower sending portal is the best way to send your emotions through a bouquet which is an ideal approach to express your love and sentiments. A good bouquet of fresh flowers can make them feel loved on their special day. Even sending flowers in midnight is so easy and hassle free at Winni. 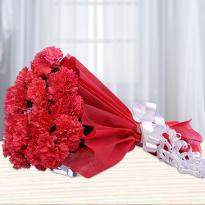 You can send them at midnight additionally our midnight flower delivery in Mumbai is a unique feature as it allows you to send your love ones even at midnight with difficulty. It's an important function and you missed to get a gift for them? Well, you don’t have to worry much. Just go to our site and place an order online for a gorgeous banquet of flowers from our collection and watch your special person jump with happiness. Forgot your anniversary? No worries, contact us and a beautiful banquet of roses shall reach you in no time. Now that's a good way to love your wife. 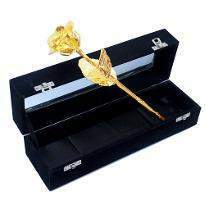 We at Winni’s ensure that all our customers receive their item within least time possible with our same day flower delivery in Mumbai service. We also make sure that the flowers are fresh and lively to charge you to fullest. We care for each and everyone. 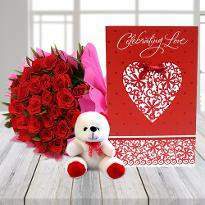 You just have to place an order with us and we are all ready to make your loved one’s day special. Whether you are in outstation or preparing for some surprise party, we make sure that all your arrangements are smooth and the plans are executed according to your wish. 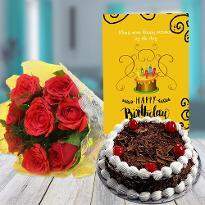 Any occasion- be it birthdays, anniversaries, valentine’s day, or marriage, our online flower delivery system makes sure every occasion is fulfilled in due time. We share we care. Your love for your relatives and the hard work and dedication of our team fusions, it can make anyone's normal day special. We ensure full customer satisfaction, so all orders are same day delivery by default. So what are you waiting for? Just open our site and place an order for amazing bouquets from our timeless collections and combos. Make everyone smile is what we want at the end of the day. The red rose were superb and fresh. It was my fathers birthday and i decided to order fresh yellow rose for him at his office. I made early delivery request to winni customer support and they really helped me. Thanks winni for making day special for my father. I ordered red rose flowers for my mum for her birthday. She loved red roses so i decided to include some of chocolates in it. I call up winni customer care and make request to personalize my bouquet.It was the most perfect chocolate rose bouquet i have ever seen. Thanks winni for making it special. Winni is best in online flowers delivery in Mumbai. 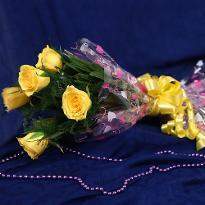 I order yellow gerberra flowers for my friend. It was her birthday yellow was her favorite color. She really liked the fresh flowers. Yellow gerberra are best for birthday occasions. The flowers were too fresh and perfect for my occasion. 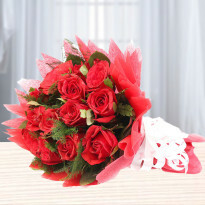 I order two sided heat shape bouquet for my wife on the first anniversary. The red roses was looking just awesome and good. It was such an amazing experience with winni. Thank you so much for making the day too special for us. I loved winni flower delivery service in Mumbai. Very affordable prices. I am totally a big fan of winni online cake and flower delivery. Please add more gifts items. I told my friends and they also started sending flowers and cakes online in Mumbai. I didn't find any compromise in quality. Thank you winni fro maintaining the quality of flowers. Best of luck. I order get well soon flowers for my aunt. She was in hospital and I was very far from her. I was feeling really bad and missing her a lot. Suddenly I watched winni add on Facebook and decided to order get well soon flowers for her. I choose big basket of yellow and white roses. My product got delivered on time perfectly. Even the delivery executive was very humble too. I feel very satisfied. Thank you winni for delivering quality flowers. I made an order for pink bunch of flowers for my lovely wife living in Mumbai. She is really happy with the products. The flowers were fabulous and fresh. It was very fresh arrangement of flowers.You guys rock. My wife was little angry with me. Suddenly I got idea to send flowers to her. I did a lot of research to find out the best flowers delivery services. Finally i got winni flowers delivery service in Mumbai and I decided to order it. I added chocolates as well with the flowers to look more beautiful. This beautiful arrangement of flowers touched her heart. She love the way of arranging the flowers. On our first anniversary also I choose winni cakes in Mumbai to celebrate in best way. Thanks winni. I ordered flowers for my boss on his birthday in our office in Mumbai. He was too happy with the delivery of the flowers. Now I and my boos are very regular customer of winni. Whenever there is someone's birthday in office we always choose winni for cake and flowers delivery. Flowers are the best way to express feeling. I feel very luck that I got perfect delivery of flowers always. Thank a lot winni for the great work done. 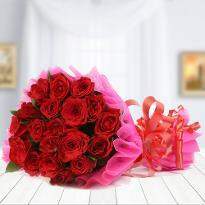 I ordered Full Of Admiration pink roses for my bua in Mumbai. My bua was in hospital and i was not able to reach her so I decided to order online flowers delivery in Mumbai. She really loves the flowers and also I attach one greeting card to it to make it more special. I love the greeting card which was perfectly attached with my product. Thank you winni for making it extra special. Please add more gift items. I was very surprised with the delivery of flowers. I made a urgent delivery of flower for my friend living in Mumbai. Sending surprise flowers to friend is such an amazing feeling. I forgot to wish his birthday but just because of winni online flowers delivery in Mumbai made my friend's day special. I will definitely share my experience with all my family members and friends. All the very best winni. Great work. Keep it up. I read one the post on Facebook about winni and decided to order a cake and flower for my friend birthday. I want to make a memorable day for my friend as we are very old school friends. I got to know that the cake was exact same as shown in picture. The flowers were very fresh and big in size. You gusy made a very special day fro my friend. Thank you guys for making the day memorable. Great work done. Keep up the good work. I recommend every to order online flower from winni. Beautiful arrangement of flowers delivery. I was searching for urgent delivery of flowers in Mumbai. After long time I found winni and read their positive reviews. I order flowers for my hubby birthday and got delivered on perfect timings. 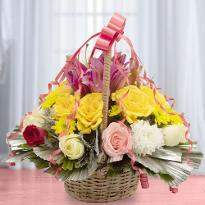 It was nice ordering with winni flowers delivery in Mumbai. I have share my experience with all my close friends. Very affordable prices on the website. Cheers to winni. Best of luck. I ordered Effervescent Surprise 100 yellow roses big bunch for my wife as we were blessed with baby girl and I wanted my wife to feel special. Finally she got flowers delivery in Mumbai hospital. She was totally shocked with my surprise. Her family really likes my surprise. Thanks to winni for such an amazing yellow delivery in Mumbai for my wife. We will definitely use your services for future orders. Thanks a lot winni. Best of luck. I wanted to send flowers in Mumbai because my wife was angry from me from few days as we both were not able to spend time with each other. I saw winni website on google and thought of sending flowers in Mumbai to my wife at her office. I wanted it to be surprise so i was little scared. But surprisingly the delivery directly delivered the flowers to her office without calling. She feels very special and her co workers also ask from where we ordered flowers in Mumbai. Thank you winni. We have so many options online now for ordering flowers in Mumbai that sometime we get confused what to choose. I feel so blessed that winni website had option for choosing flowers and cake according to occasions. Now I don't have to think too much what to choose or what not to. I simply click on occasion section and get my exact flowers in Mumbai. Good work winni. Keep going good work. I wanted to surprise my women on our first valentine day. I saw winni website and found it very affordable and the reviews were also good. I choose Groovy red roses heart shaped bouquet. 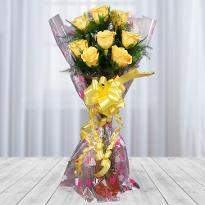 I send flowers to Mumbai for day time delivery so that she get the flowers in office itself. After receiving flowers she send me images of flowers it was too beautiful and fresh looking. Also it was big in size. We had good moments on our first valentine. Thanks to winni. It was our fist anniversary and I already make special plans for dinner party and one special diamond ring. But without cake and flower there could not be any celebrations. 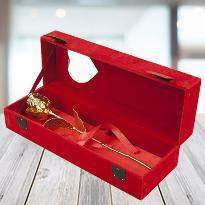 Especially for womens if you want to make them fee special then gift her flowers. So I decided to order flowers and cake in Mumbai. I found winni website and got my things on time. My wife feels really special and we spend a good time eve. The cake was very spongy and fresh. I love winni service. Thanks a lot. I was out of the country but did not want to miss my sister's birthday. I have never ordered online before so it is difficult for me. But Winni made it a very smooth experience and the flowers look even better than the photo online. Thank you Winni! I am so impressed with an online flower delivery service. I had a mistake in my sister's address and I called customer service and he was so nice! The flowers were delivered, early the next morning, and my sister said they were absolutely beautiful. Thank you for your great service! This is second tym I-m very happy and fully satisfied with the amazing services u are providing..thanks for making my day so special...n cake is fresh n yummy n flowers also very fresh Ã°ÂŸÂ˜ÂÃ°ÂŸÂ˜ÂÃ°ÂŸÂ˜ÂÃ°ÂŸÂ˜Âwell done winni ..
Thankyou soo much to deliver my love to my loved one. Everything was perfect- only the core area to improve is that midnight delivery must be delivered at exact 11:50pm. Thany once again for this memorable service.